the upper arm and wrist in conjunction with a shift of balance of the body. An atlatl can launch a well made dart to ranges greater than 100 meters.The word atlatl (pronounced at-la-tal) is derived from a Nahuatl word for "water thrower", as it was most commonly used for fishing. The atlatl is accredited with putting humans on top of the food chain. Humans have the naturally ability to throw object long distance which compensates for the fact we cannot run very fast or don’t have very sharp teeth and claws compared to other animals. The atlatl is the predecessor of the bow and arrow. 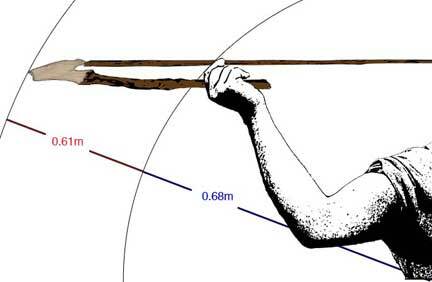 Using an atlatl increases the linear speed of the dart by about 90km/h. Charts to go with the lessons - also can be found within corresponding lessons.